L'accès à la piscine depuis la terrasse murée orientée sud se fait via 1 portail fermant à clé. À l'arrière de la propriété, 1 terrasse isolée et sécurisée idéale pour les barbecues, les jeux à l'ombre ou la détente. Base idéale pour découvrir la magnifique île de Fuerteventura ou 1 endroit où vous détendre et apprécier le mode de vie sans stress ; Esmeralda est 1 lieu prisé qui ne vous décevra pas. Vols depuis tous les principaux aéroports du Royaume-Uni avec Easyjet et Ryanair et depuis Dublin avec Aer Lingus qui fait désormais des trajets toute l'année. Ryanair effectue désormais des vols 2 fois par semaine depuis Dublin et le dimanche depuis Cork. Caleta de Fuste est à 5 min de route de l'aéroport. Belle et luxueuse station balnéaire avec nombreuses attractions, bars et restaurants. Il n’y a pas de gratte-ciel. Ce n'est pas 1 station sauvage comme d'autres ; superbes plages rarement bondées et sûres pour les enfants. Transports en commun très efficaces et peu chers dans la région. Grande salle de bains : baignoire/douche, lavabo et toilettes. Cuisine équipée : plans de travail en marbre, cuisinière vitrocéramique et four/grill, réfrigérateur/congélateur, bouilloire, grille-pain, micro-ondes et appareil à croque-monsieur. Ustensiles, vaisselle, torchons, etc. fournis. Lovely apartment, great facilities and location. Would definitely come back. Delighted everything was to the high standard you expected. We aim to please. Hope to see you again soon. First impressions don't always count! Our first impressions when being dropped off at the apartments were that we may have made a mistake. Uninviting facade at the end of the road where everything appeared to be shut. However once inside we were pleasantly surprised that the apartments looked very nice. The general areas were well maintained and clean and out apartment was very well situated near the pool. The apartment had everything we needed but it was a shame the ceiling fan didn't work. The washing machine was a real bonus for us as we were going on to another holiday two days after our departure. It was nice not to have to fight for a sun bed as pool etiquette was generally followed. Lovely and quiet in the evenings and never heard a peep from any apartment after midnight. All the shops and restaurants were a few minutes walk away. Overall we really enjoyed our stay and would book again. We endeavour to supply a great apartment with all mod cons.its nice that people appreciate what we offer for example late check out,washibg machine and iorning facilities,hair dryer and an extra fold out bed if required. Had a great 11 night stay. Apartment itself had everything we needed. Fantastic location with only a short walk to all restaurants, bars & shops. 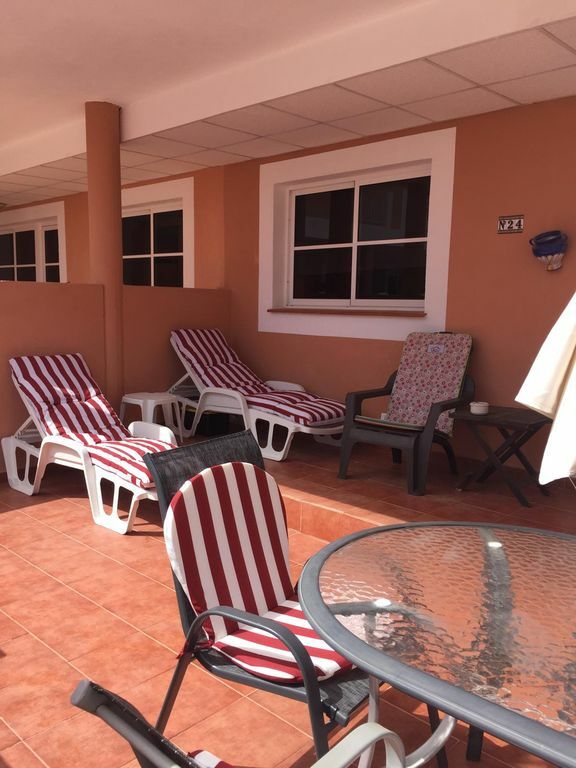 Esmeralda apartments have a mix of residents & visitors, all are very friendly and the pool area has a nice atmosphere during the day and is quiet of an evening. The apartment is clean, & the pool area is also cleaned and very well maintained on a daily basis by the Esmeralda 'President' (very nice guy). Usually Fuerteventura is quite windy but as the complex is enclosed you get a nice sun trap during the day. Overall we've had a fantastic holiday and wouldn't hesitate to book again. Lovely peaceful small complex...fully equipped apartment. Met by Steve at apartment complex which is accessed through locked gates so excellent security. Shown round apartment which was good size and easily accommodated the 5 of us...2 adults and 3 teens... 3rd bed a fold up camp bed. Everything we needed was provided with beach/bath/hand towels, fully equipped kitchen, games, books, WiFi included...we found apartment catered for all our needs. Lovely patio area with furniture overlooking the pool area which was so peaceful/quiet with strict rules on no balls etc around pool or big inflatables etc. Even though we went over Easter holidays very few young children and those that were there were well behaved/polite. Overall a very relaxing, peaceful holiday and would definitely consider going back to this complex. I'm delighted that you liked the apartment and complex so much. We endeavor to supply a perfect holiday for our guests and continuously upgrade and paint each year. The fact we have 2 patios front and back gives the customer a world of space while holidaying. Its safe ,close to shops restaurants etc. and easy to get to the beach. We supply all mod cons including hair dryer beach towels and all bath and hand towels. Once again thanks for your lovely comments and I look forward to your revisit. Booking Notes: We normally request a non refundable deposit of €100 per week booked and the balance payable within 6 weeks of arrival. Payment can be made by bank transfer or by bank draft in either sterling or Euro. Changeover Day: Because of the variety and frequency of flights now available to Fuerteventura we do not have a set changeover day. We will endeavour as far as possible to accommodate guest requirements but we do ask for flexibility to allow for cleaning etc.